Older Single Mum: Hotter Comes to Brighton and I challenge their 100% Happy Guarantee. Hotter Comes to Brighton and I challenge their 100% Happy Guarantee. 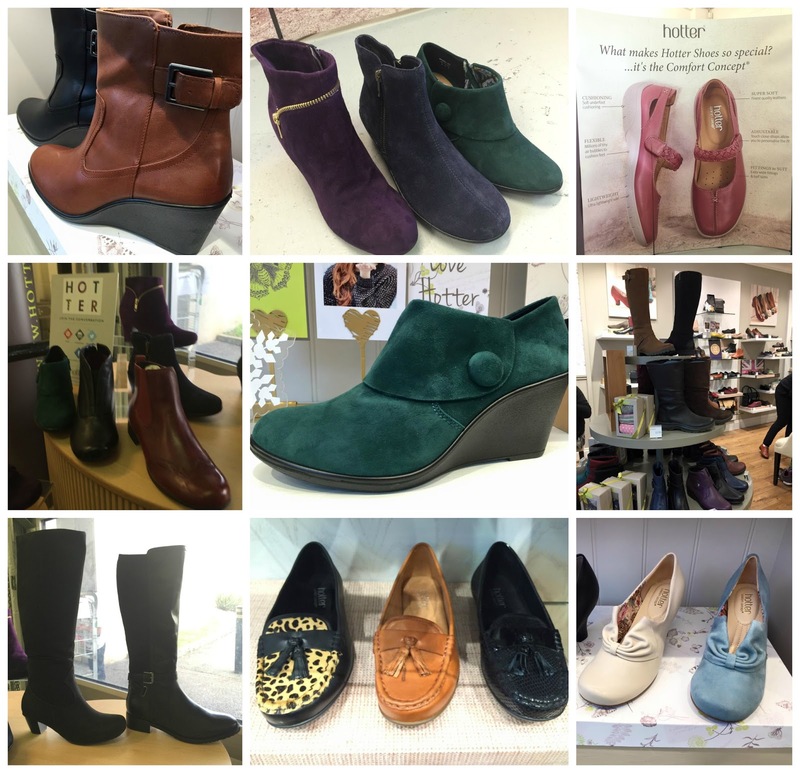 When I first wandered into a Hotter shoes store a while ago, it left me a bit nonplussed. Bloggers seemed to be banging on about them, but they really didn't appeal to me. My feeling was that they were frumpy. Fast forward perhaps a couple of years and I found myself invited to one of their events ahead of the Blog On conference in Winchester. It was very tempting not to go, but it seemed rude not to try to see what all the fuss was about. I turned up with my kids in tow, accidentally very late because of severe traffic congestion on the trip down and missed most of the presentation about the brand, but was met the moment we walked in the door by some surprisingly serious colour and style stuff like this. Hotter customers want comfort and colour. Hmmm. Not so frumpy after all then. And all the talk was about having a 'Hotter Moment,' something you get when you try on a pair. Still sceptical and trying to catch up on what I'd missed, whilst trying to keep my two children who'd been restrained for three hours in the car under control, didn't make for a very relaxing start, but the staff are incredible and as soon as I slipped on some lovely looking loafers, my 'Hotter Moment' came. They were breath-takingly comfortable. Their 'Comfort Concept' passion is about making shoes as comfortable as slippers - with soft leathers, supportive styles, all sat on millons of air bubbles. They worked immediately for me and I ended up ordering some to be able to write about them properly. However, despite it normally suiting me to wear a wider shoe - their fittings are generally wider than most other shops, they gaped a bit at the sides when I walked and this put me off wearing them, which was disappointing, having just started my new job and thinking they'd be perfect for it. I, therefore, had to return them and was gutted to do so when I'd acquired the art of walking on air! Yet Hotter are very proud of their 100% Happy Guarantee and insisted I was receiving no special treatment when an exchange was offered. If I'd been a paying customer, a refund would always also be applicable if necessary. I had to give my loafers the boot and loved both of these - the Belle (note the adjustable calf fit) and the Ivy (only tan left in stock or they would have been my choice). How many Hotter Moments can a woman have I wondered, plus how much luckier even that they've just opened locally in Brighton - to great fanfare?! Hotter opening in Brighton last week. And could they be more British? We were treated to a Town Crier and a choir, Bucks Fizz and M & S nibbles! 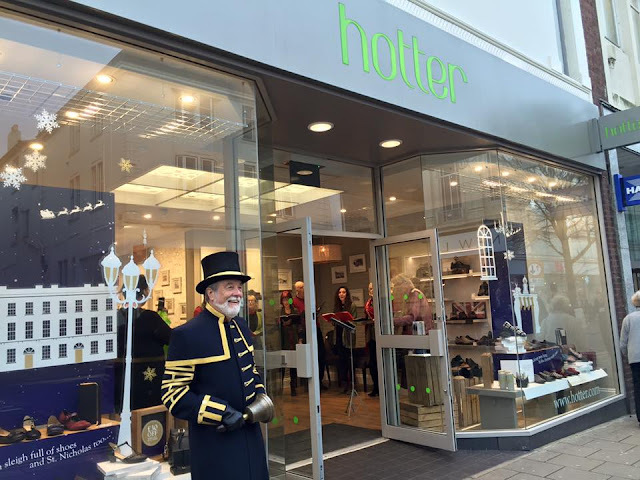 Hotter make more shoes in the UK than anyone else, won the Queen's Award for Enterprise and UK Manufacturer of the year 2015. They advised that the Shipley loafers might not have been right for me, because they design different shaped shoes for different shaped feet. I'd have loved those black Ivy boots above, but, alas, only tan is now available and they're not my colour. It was the Belle boots that came home with me instead and, as it happens, I'm really pleased with them. 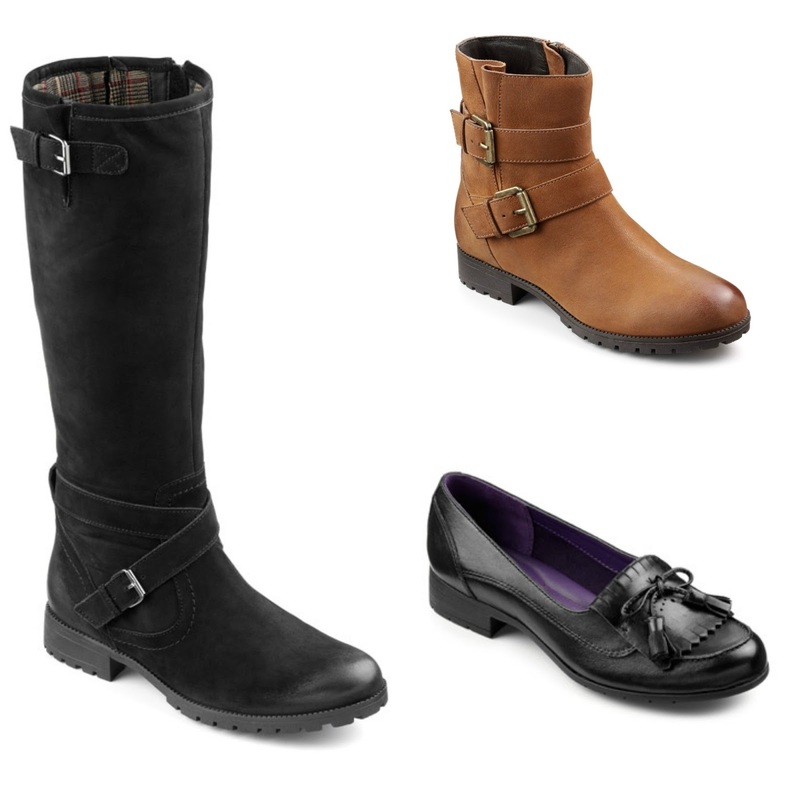 They are just dandy - really light and somewhat springy underfoot, plus the adjustable calf fitting means they can be worn over skinnys or more snuggly done up with a skirt. Styles sell out quickly as everything is unique to them. Their technology is world leading and, apparently, Hotter are led by their customers who want comfort and colour and up to date designs, so it's no wonder they now have a million - including internationally - seeing as they patently (pun intended!) listen to them. Plus, there are always plenty of decent discount codes on the go. Sometimes, it's not a bad thing when bloggers are banging on about a brand. I'm off to check out their matching handbags ...! Disclosure - Hotter gave me a pair of Belle boots for the purpose of this article but all words are honest and my own obvs. oulgrave and Melanie Killilea visit Buckingham Palace. Your Belle boots are gorgeous Anya... it's not surprising that you're so taken with them. I think there's a Hotter Store not far from me... heading off to check now! I got the Belle boots too! So now we can be twins. I love them, they are so comfy and go with everything. How fantastic that you got your Hotter Moment but what a shame they had to be returned. I am glad they were able to accommodate you. I love mine.